This entry was posted in Croydon - The Second Tech City and tagged croydon, jonny rose, Tech City. Bookmark the permalink. I am SO behind this – it is such a great thing you are doing. I know I don’t really live in Croydon any more, but if there is anything I can do to support this thing, I will! Why is everything on a Thursday, am even struggling to make my own networking events because they’re on a Thursday! Won’t be able to attend but hope it goes well Jonny. I will Tweet like mad though! Pingback: Croydon – the new Tech City? I was there on the 4th to hear your well thought through and presented proposal. We haven’t spoken before just a brief “hello” at MY. Anyway, since that night I’ve not been able to get the idea of a Croydon Tech City out of my head. I’m not a techie myself (apart from my greencroydon website but I don’t count that)but I want what is best for this town to succeed and as you’ve suggested have a growth industry to make up for the declining retail or manufacturing offer. Regretfully, I don’t have anything to bring to the table other than a suggestion that I’ll come to for consideration. Today (25th) I went to the Old Street ‘Silicon Roundabout’ to see for myself the area involved. I just wanted to see what they have to make a comparison with Croydon. It’s proper grotty and in terms of a more attractive environment we have it beat hands down. There’s the traffic blighted roundabout which divides that area up in to 3 or 4 separate roads. The tube station area is grim, but there are one or two smartish eateries all things Croydon has already and will get more of with the Whitgift development. I saw some of the tech businesses around the roundabout area. One thing that catches the eye are signs on buildings saying ‘short term office space from 2500sq ft immediately available’. I saw at least 3 of these. Obviously, anyone thinking of a start up would be encouraged to take advantage of this as it is short term so if they don’t succeed or don’t want it they are not tied in for a long contract. Where in town do we have similar offers for short term lets? Is this part of the Old Street attraction that enabled it to kick start? Perhaps this is what we need. I recall you saying that geographically you saw such a tech city mushrooming around the MY area or certainly MY as a hub for it. Not wanting to run before we can walk but personally, I think the area of St Georges Walk with the empty offices above would be ideal. It’s like a city block in itself and there are the retail units below which could all be rejuvenated and provide services for the workers. I understand the Nestle tower will be made in to flats so it doesn’t sound as if there is a mass demolition project that is going to happen. How does that sound as a suggestion? As you have said it’s a long way off but if the office space there could be made available at small and short term rents for start-ups it could give the physical infrastructure. It’s close to the college and of course close to MY and close for all the transport and facilities. 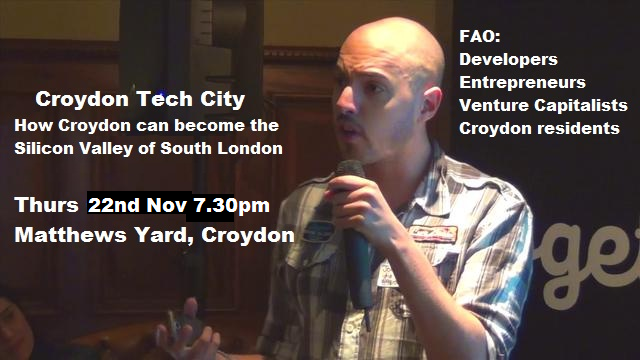 I look forward to your next instalment and ultimately a Croydon Tech City. As a greenie I’m in favour of these low-carbon digital businesses!! Good points, I see where you are going. You are focusing on the property value. Can I offer more food for thought? … what do you think happens to the rental value of the property they do all this good stuff on? … what do you think happens to their earnings, profits, salaries, wages? Think about this very carefully. Remembering that almost 100% of enterprise in Croydon is in rented property. The landlord collecting these rents not only absent from Croydon, often not even in this country, having contributed nothing whatsoever to the rising value. If you can see this you will have your answer immediately. I’m happy to meet up with anyone who wants to go into further dialogue on this. I don’t know why the focus on rented property. Almost all business in Silicon Valley is in rented property. In areas that have mostly higher rents than much more expensive parts of London than Croydon. Most business in London, for that matter, is in rented property. Why? Not because there aren’t alternatives, but because, and I say this as someone who has been involved in starting half a dozen companies, it makes absolutely no economic sense for most companies to own property unless they’re extremely large. It ties up capital at expected returns far below what any reasonably successful business will hope to produce were they to invest it in other aspects of their business. A business that don’t even try to beat a property investment in terms of return on investment, is horribly bad news for it’s owners and investors: They’d be better off investing in that property than using it themselves. We have been donated £200 to fund a young upcoming tech guru, to help our campaign in the Croydon North by-election over the next month. Do you know any young people with a keen understanding of how to optimise social media. We need to ramp up the social media side of our campaign. Candidate for the Young People’s Party.